This is an arresting image (from the Times Atlas). In your mind, which is the biggest: the US, India, Western Europe or China? How big do you think Africa is in comparison? An odd comparison and a bit misleading. All 53 countries of Africa could not contain just three others: Russia, Canada and the United States. Equally misleading. I agree with nneoma. It would be better to compare individual African nations with other nations, Nigeria for example. The African continent is not any bigger than Eurasia or than North America. It is also extremely diverse in its physical geography. Isn't Patrice missing the obvious point being made here? What is misleading about the image when it is clearly telling us that Africa is so large that you can fit the whole of the mainland United States, China, India, Western Europe and Argentina into it and still have nearly half a million sq km left over? Nneoma youre correct, and its kind of the opposite when the citizens of the United States are referred to as Americans, when in reality there are two large American continents, North and South. And even North America to which the US belongs, is made up of three countries, not just the United States. The graphic compares the size of the second largest continent - Africa - with the size of a few individual, albeit large, countries. I tried to give an example in my comment above that would show how this type of comparison could be used to give the impression that Africa is small, which of course, it is not. The graphic uses a denominator trap, is pointless and, as Nneoma said, reinforces the widespread misconception that Africa itself is a country. Patrice, I disagree. 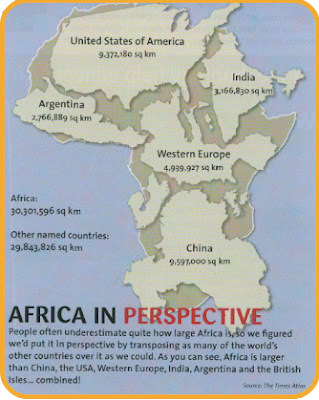 The point of the image is to demonstrate the actual size of the African continent, and to suggest how truly large it is. China and India are two of the largest countries on the Asian continent, and indeed the world. The US is massive, and Western Europe while not being a single country as you have suggested, is a huge chunk of the continent of Europe. The point of this is that the African continent is so large all of these huge land areas combined are not enough to fully cover it. Wow that's crazy!! I always forget that China and India aren't that huge, they just have extremely large populations. Rona, China and India are really quite huge, and not only in the size of their populations. Both belong to the world's top 10 largest countries. I'm even surprised to learn that China has a larger geographical land area than Canada, which I always thought was the second largest after Russia. What is your source? I too have always thought that Canada is the second largest country, followed by either the USA or China, depending on whether the disputed territories of China are included in its area. we're told that China is the 4th largest, after Canada and the USA... Something to do with the disputed territories possibly... Anyway, it seems to me that there is some uncertainty concerning these issues, because some top ten lists contain Algeria as the only African counry, whereas others have Sudan as being among the top ten. I think the europeans knew what they wer doing and wanted to inflate their egos and make the africans feel inferior and not truly know actual size of their continent. I agree with that picture. Do some more research folks Africa is much much larger than the North america and europe. Due to this size it is difficult for all of the countries on that continent to be united. The would rule the world otherwise. But wait they were robbed by the europeans.